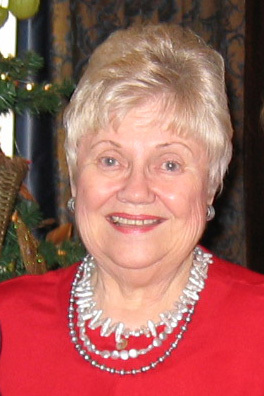 Betty Bushman was the first female baseball broadcaster in 1964. Living with her husband high in a condo building in the Country Club Plaza, Betty Bushman is known today for charity work, not making male sportscasters swallow cigars. 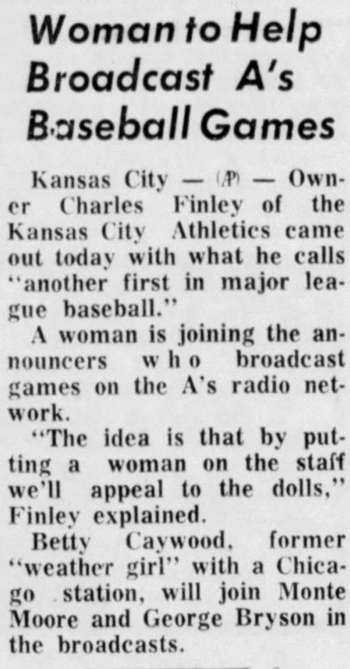 But Bushman, 85, was the first woman baseball commentator in 1964 (and one of a handful since), hired by Charles Finley for radio broadcasts of the Kansas City Athletics. “The idea is that putting a woman on the staff will appeal to the dolls,” Finley told a newspaper reporter. Because her job was so unusual for a woman, she even appeared as a mystery guest on the national program What’s My Line in 1964. Her name was Betty Caywood then, and she was a young, attractive model who had worked in Chicago as a television weather announcer before Finley decided to add her to the broadcast lineup. A Sept. 16, 1964 Maryville Daily Forum article. The 1948 graduate of Westport High School also had a master’s degree from Northwestern University in Chicago and had taught English, speech and drama at Salina, Kan. But divorced then with two young children, she said modeling and broadcasting paid more than teaching. She really didn’t know much about baseball then, she said, and when the legendary Red Barber called her over during a Yankees game, he asked who was batting. She had no idea. He asked who he was by his number, which was seven. She did not know it was Mickey Mantle. Barber asked her what the batter was doing. “I said striking,” Bushman said. They told her it was swinging. She moved on at the end of that baseball year. But it was one very small part of a long life. She was born in Chicago but moved here with her mother at about age 11. At age 17, her mother enrolled her in a modeling class. Her master’s degree, teaching, marriage and divorce came later. It was not until age 27 or so that she applied for a first modeling job in Kansas City, and for a moment it seemed like her audition was going to go all wrong. “Of course,” Bushman said, and she was soon teaching the new way to other Kansas City models. She was later hired by a production company to do a nationally syndicated show called “Builder’s Showcase,” which was directed to local builders and buyers in cities nationwide. For more than two years, she and a pretend husband went though houses in various cities commenting on them. She left that job after an incident that would today be called sexual harassment, but even women did not call it that then. At one point, she said, she got an offer to host the Today Show. But that would have meant moving to New York City, where she did not like the look of schools and living conditions for her two young children. “Barbara Walters owes me her job,” Bushman said. In 1965, the year after the Athletics job, she married her second husband, Jordan Bushman, a principle with Bushman Construction Company. They raised two more children and celebrated their 50th anniversary this summer. So this unique sports commentator – now a Kansas City Royals fan – has been around a block of history.